Why are the annals of crime worth studying? Author Carl Sifakis suggests that crimes and the people who perpetrate themthe killers, thieves, madams, prostitutes, crooked officers and judges, political bosses, gangsters, and even the victims involvedreflect the society we have created. 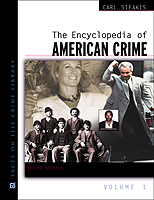 In this comprehensive and objective reference to America's criminal past, he offers 2,000 A-to-Z entries covering significant crimes, criminals, and law enforcement figures and techniques. Entries are chosen based on their symbolic or historical relevance and consist of biographies, definitions, and detailed accounts of criminal activities.